The latest fast-bowling sensation from Pakistan, Hasan Ali has stormed into the headlines with a remarkable feat, becoming the quickest Pakistani to 50 wickets. 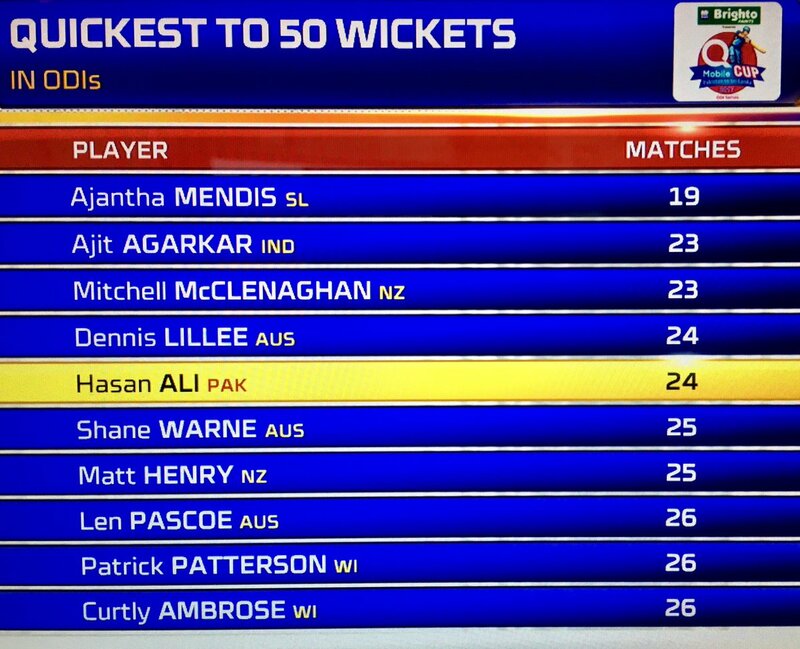 Hasan achieved the landmark in 24 matches equaling the great Australian pacer Dennis Lillee’s record. Having come to the limelight following his match-winning bowling performances in Champions Trophy 2017, Hasan hasn’t looked back since. He is easily the leader of the Pakistani pace attack in the absence of Muhammad Amir and definitely the go-to man for Sarfaraz whenever he needs wickets. Hasan overtook Pakistan bowling legends, Waqar Younis and Saqlain Mushtaq, who reached the 50 wickets mark in 27 and 28 ODIs respectively. The right-arm quick, who took 13 wickets at 14.69 in the Champions Trophy, played a crucial role in helping Pakistan win Champions Trophy for the first time. Hasan also became the leading wicket-taker of 2017 (40) with his brilliant 5-34 against Sri Lanka in the third ODI at Sheikh Zayed Stadium, Abu Dhabi. Behind him are Afghanistan’s Rashid Khan and England’s Liam Plunkett, who are both four wickets short of Hasan’s tally. Hasan’s consistent run with the ball has made him the leading wicket taker of the year. With figures of 10-0-34-5, Hasan Ali is now the only bowler with three five wicket hauls in ODI cricket in 2017. The last time a Pakistani pacer took three five-wicket hauls was in 1999 by none other than Pakistan’s bowling coach Azhar Mahmood. Hasan Will be Number One In ODI In This Year INSHA ALLAH ! aur aa gya comment meray bhai ka foran. bhai ager wo comment kerta aur sab say pehlay kerta hai to is say aap logon ko kia nuqsan hain. usay ager acha lagta hai to us ki khushi say tum logon ko kion praishani hai. Kush raho aur khush rehnay do. With these new shining stars emerging in the Pakistan cricket team, Pakistan’s gonna produce even more cricket legends. Proud to see team Pakistan coming back on track to win yet another World cup. Agar sab ko merit pe liya jaye to PAK can easily win the world cup warna politcis ke waja se team karab hoti hai warna talent toh bara parha hai PAK mein.